The week before Thanksgiving, Sally and three other local advocates attended the State of the Art Conference on Postsecondary Education and Individuals with Intellectual Disabilities at George Mason University in Washington D.C. These four moms have one thing in common with many other parents across the region—they each have a child who wants to go to college. What sets them apart is that post-secondary options for their children are extremely limited in the area. There is a call to action on a larger scale: Oregon’s 40/40/20 plan states a goal that by 2025, 40 percent of adult Oregonians will have earned a bachelor’s degree or higher; 40 percent will have earned have earned an associate’s degree or postsecondary; and 20 percent will have earned at least a high school diploma or the equivalent. That’s a lofty goal, and if it is include ALL children, there needs to be real change in expectations and programs for children with disabilities. Also on the trip to D.C. were Ann Donaca-Sullivan, a professor of education at Concordia University, Maureen Higgins, who works at the Multnomah County Library and is mom to Eddie, a 13-year-old 7th grader at Beaumont Middle School, and NWDSA/ABI Executive Director Angela Jarvis-Holland. These women have known each other for many years, and came together most recently as participants (and in the case of Ann, facilitator) of the Dreambuilders transition cohort that NWDSA and Community Vision, Inc. created and partnered on last year. 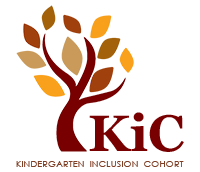 The cohort was designed to help families begin preparing for the transition out of high school several years in advance. It became clear that while many students in the program have dreams of college, and their parents are supportive, there are just a handful of post-secondary options available around Oregon and Washington. There are several initiatives in the works around the country, and many of the people working on the issue came together at the State of the Art conference this month. 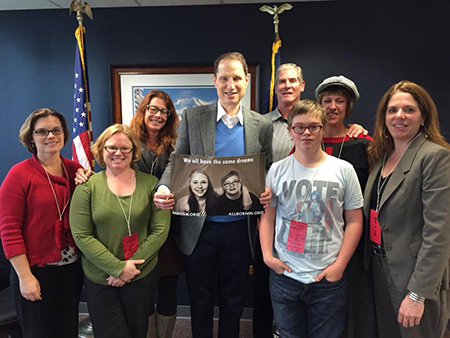 Daniel Jarvis-Holland recently got a chance to share his hopes and dreams with Oregon Senator Ron Wyden. As Daniel pounded his fist on the table and declared, “I want to go to college!” it was clear that Senator Wyden understood the urgency that Daniel feels about his future. A freshman at Benson Polytechnic High School, Daniel has some very clear dreams, from comic book artist to café owner. His brother Quinn is a student at Portland Community College, and Daniel sees no reason he shouldn’t be able to follow in his brother’s footsteps. At Beauty in Diversity, a recent event at PCC’s new SE Campus, Daniel and Quinn both spoke eloquently about the need to work together to make college more accessible for all students. On the refrigerator door in the Jarvis-Holland home is a magnet that reads “Benson High School Class of 2018,” a reminder every day that the future will be here before we know it. Angela, Sally, Ann and Maureen are excited for the opportunity to join the national conversation on this subject. Stay tuned for a community meeting when they return, where they will share what they learned and work to build more community momentum to make real college opportunities available to anyone who shares the dream of going to college.